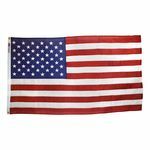 Traditional Cotton United States Flag - Made in America! These cotton American flags are made of a traditional heavyweight cotton bunting. 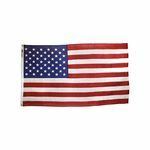 They feature good durability, vivid and vibrant color presentation with traditional sewn strips and embroidered stars. Perfect for Ceremonies or Special Flag Holidays. Made in the U.S.A.